You may have noticed this dress sitting in my "mend pile" in my Snapshots post yesterday. It is such a lovely dress, but I knew I'd get more wear out of it if I just removed the cap sleeves and made it a sleeveless dress. I have a confession to make: I'm terrified of cap sleeves. Sometimes a person can say something to you and it sticks with you forever. This is the case with me + cap sleeves. Plus, I have too many sheer floaty tops that would look perfect under it. It had to be done. In other news, Twitter told me today is the first day of Spring. I was pretty bummed that the first day of Spring was so chilly (AND WINDY) until I realized that I am totally in love with this coat. Spring duds under a pretty coat is something I can totally live with... that is, until Spring weather is really here. I am VERY ready for picnics and park dates! This whole shoot is absolutely stunning! I love that you always choose interesting backgrounds for your outfit photo posts! I'm in love with this adorable Dear Creatures dress as well! Such a gorgeous outfit! Your shoes are fabulous too. Love the blue shoes, very cute. So pretty and dreamy - you just always get it right! Lovely outfit! And I love your hair. beautiful! your heels are to die for! Yes, the coat is FAB! Ah! Is it because someone told you your shoulders look to wide/manly in caped sleeves? Because that has happened to me, and I rarely wear them now! I think it was a good choice to chop off the sleeves though, so many layered pairing to be had! I love your outfit! You always do such a beautiful job of mixing items together to make the perfect outfit. 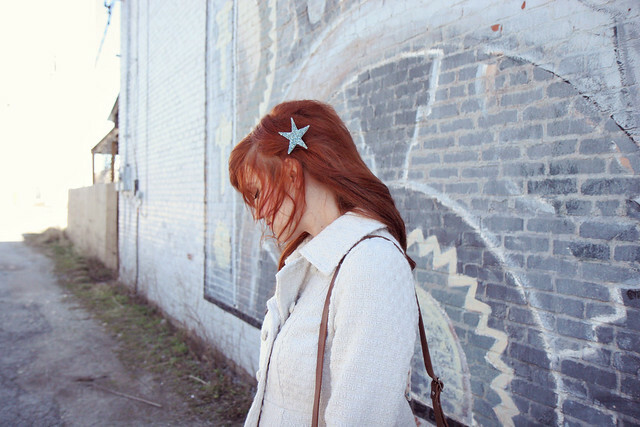 I especially love the star in your hair. It adds a little touch of whimsy. I have several dresses in need of a good 'CHOP!'. This inspires me to get to it! Gorgeous!! I love the stockings and dress!! Never thought of taking the sleeves off a dress-not that I'd know how! Cute! I love capped sleeves, I think they are really cute part of a shirt. 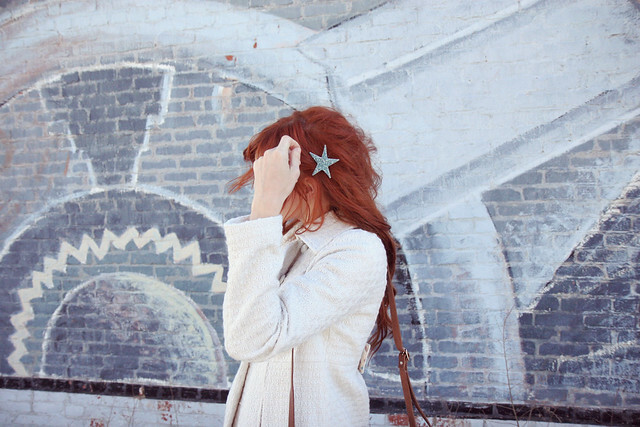 I liked the star in your hair, I think it just makes the whole look cuter. I so understand the cap sleeve problem. Someone picked on my "fat arms" when I was young and wearing a cap sleeve shirt, and I have seriously never worn one since. Although I'm confident with myself and realize 15 years later that I am not in fact fat, like you said it's one of those things that you never forget. Either way, you are gorgeous and I love this outfit so much! I love that dress. So cute! SO BEAUTIFUL! I LOVE THE COLOURS, VERY SOFT! my boyfriend HATES big poofy sleeves. And I mean HATES them. I am strictly forbidden. But secretly deep down I think they are adorable and I sneak them on sometimes. I love your outfits always. This dress is adorable and I LOVE your shoes so much! I have a thing against cap sleeves too - they aren't just flattering for my arms, I don't think. Wow, it’s a lovely dress. I like your blue shoes. Those are adorable. Looove those shoes. You look like a star! 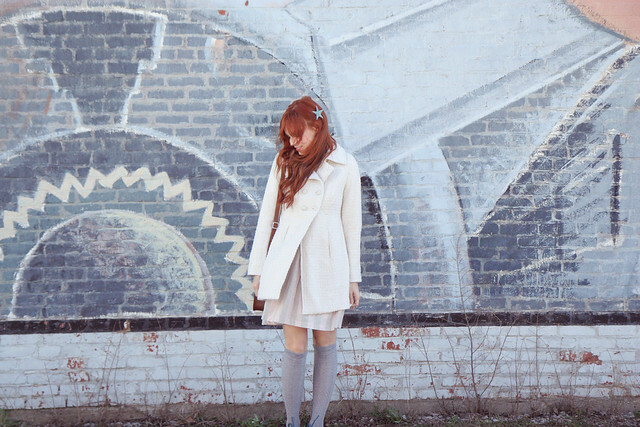 This outfit is beautiful, I love your dress and coat!